Andrea Bacci’s team will campaign the entire season with two Alfa Romeo Giulietta Veloce cars whose. Bacci is set to announce its driving squad in the coming days. 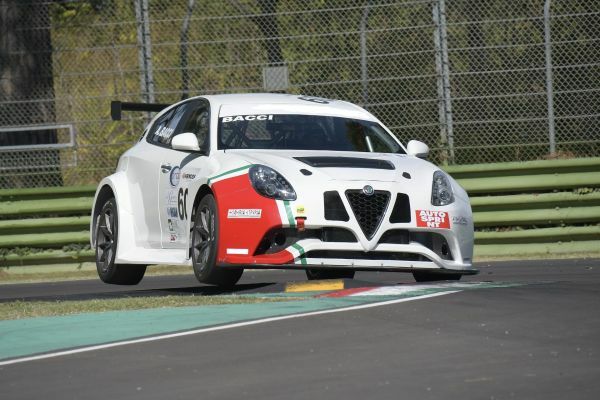 The Italian team Bacci will take part in the TC Open series for the full season with two Alfa Romeo Giulietta Veloce cars equipped with the original 1,750 cc turbocharged engine. The team, located in the center of Italy (Firenze), prepared the two cars with several purposes: Bacci Romano Trasmissions is a company, which produces racing gearboxes for all types of cars, from rally to hill climbing and track competitions. The new “Giulietta Challenge” started in the middle of year 2016 in order to develop a new sequential gearbox for turbocharged touring cars and the championship rules seemed to be perfect for this project. The company chose some different steps for its development, starting from the manual engagement with gear lever and evolving the project with an own project paddle shift system. The evolution of the car went obviously together: the target was to use as many Italian national partners as possible, to have as a final result a full Italian product, as a real Alfa Romeo has to be. The two cars have been prepared by AR Motorsport, which has a twenty-year long partnership with Andrea Bacci for the preparation of his touring cars during the last two decades. The technical studies and the simulations have been executed by a young startup company (Meccanica 42) of young engineers of the University of Firenze who all came from the Formula Student team of the same university. Autotecnica Motori is in charge of engine tuning, Sassa roll-bar supplied the roll cage, Magneti Marelli Motorsport the Electronic Engine Management, OMP provided many components for the car preparation, Andreani Group supplied the Ohlins dampers developed at the request of Bacci, OZ racing the wheels and AIM the data logger dashboard. The two Alfa Romeo Giulietta cars competed in the last three racing weekends of the Italian Touring Car Championship (in TCT Class) during year 2016, obtaining excellent results also fighting directly with the TCR cars with different engine performances. “The development of the cars during the 2016 racing weekends - says Andrea Bacci - was very fast and positive on all the sub-systems of the cars; for the new season the European challenge is very interesting and exciting for our team. We are sure that the competition will be challenging. We know there are a lot of competitive drivers who will fight on the most prestigious circuits comprised in the championship”.